My first musical revelation was in the very early eighties before I was barely 10 years old when I fell in love with electronic music. Being that young I only really had access to mainstream radio (BBC Radio 1 in the UK) and a weekly music show on television called Top Of The Pops. I started to hear stuff I really liked. My dad was (thankfully) a bit of a hi-fi buff so I was able to start creating a mixtape from the radio (primarily the Radio 1 Top 40 Chart Show Sunday evenings) on to cassette tape and repeat listen to that music that gave me goosebumps. Over the course of a couple of years including going through my parents' small record collection discovering Jean-Michel Jarre along the way the tape took shape with Jean-Michel Jarre, Kraftwerk, Yazoo, Depeche Mode, Ultravox, Visage, Gary Numan, the Human League, Orchestral Manoeuvres In The Dark (OMD) and Heaven 17 included on it. Electro Hip-Hop followed with the Street Sounds Electro series and took me through to the latter half of the eighties until Gangster Rap destroyed Hip-Hop but by this time I was collecting synth-pop, new wave, new romantic and electro music in earnest. And then there was the revelation. I was aware of how important the Mute Records label was to electronic music and one day in 1988 (21st September 1988 to be exact), whilst browsing some 7" singles at a record fair, I came across a blank white label promo with the catalogue number MUTE 58 etched into the runout groove. Duly purchased because it was Mute, without knowing who or what it was, I took it home and put it on the record deck. 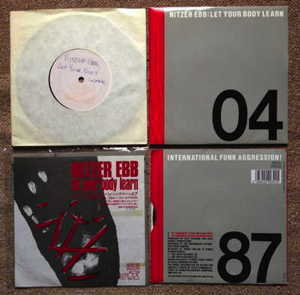 MUTE 58 is of course, Nitzer Ebb's "Let Your Body Learn". And this marvellous slice of vinyl turned out to be one of the biggest musical revelations in my life. Aggressive rhythm machines thundering out electronic body music! My life changed at the exact moment that the needle hit the recorded groove and a whole world of new music was suddenly awaiting to be discovered. No longer was the radio friendly mainstream music the only sound in town. Experimental, industrial, sampling, noise (and all the other silly genre names) all became fair game to me. Genres weren't relevant anymore. Music was simply important to me in all its glorious forms. How do I know it was the 21st September 1988? Well I had become obsessed with collecting electronic music and documenting the releases, writing articles and discographies for collectors' magazines plus creating databases of everything I bought/discovered. So I know exactly when and where this revelation happened. My third musical revelation was Claus Larsen's Leæther Strip and Klute aka Klutæ but that's a whole different story starting on a different date.